Harvard Air Powered Hockey Table - G03233W 5 ft. Hockey Game Table. Free shipping to the lower 48 United States for this Harvard Hockey Table. 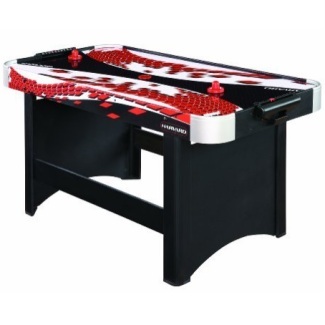 This hockey table features a 5-foot table top, a 110V air blower, 2 strikers, and 2 pucks. This size of hockey table makes it great for homes with limited space in their game room, but still want to excitement of air powered hockey. 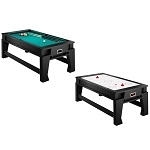 This table hockey game also comes with a 90 day warranty from Escalade Sports. Table top length: 5 ft.
Material of construction: MDF board. Comes with 90 day warranty from Escalade Sports. Shipping dimensions: 62.50 inches L x 40 inches W x 8 inches H.
Assembled dimensions: 60 inches L x 31.5 inches W x 30 inches H.
Product delivered via an LTL freight carrier for a curbside delivery. This type of delivery requires the customer to be present to sign for the package and to help the driver unload the product. The driver will not assist bringing the hockey table into your home. Dimensions: 63" x 40" x 8"